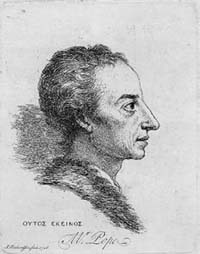 Alexander Pope was 30 years old and already a celebrated poet when he moved to Twickenham in 1719. From an early age he loved walking in the woods or along the river and reading. 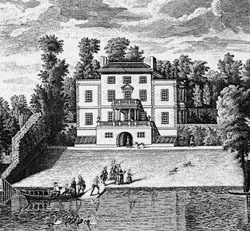 He built his house here on the banks of the River Thames and made a path to his garden on the other side of the road by digging a tunnel. Pope decorated the tunnel and its entrance with shells, mirrors, crystals, and other stones, making a fanciful Grotto or Cavern. Many of his friends brought things for his Grotto including the Prince of Wales who sent minerals from �the prince�s mine in Cornwall�. On one of his visits, the Prince of Wales must have taken a fancy to Pope�s dog Bounce. 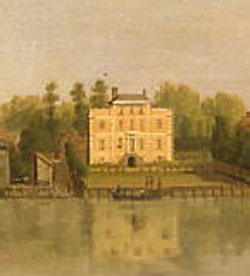 A puppy from her next litter was sent to the Prince at Kew, with this engraved on its collar: I am His Highness� Dog at Kew; Pray tell me Sir, whose Dog are you? He needed a place to write his poetry and lay out his garden where he could live in tune with nature. See 'Mr Pope & Others at Cross Deep' by Tony Beckles Willson. Read a selection of Pope's poetry and prose.